Malcolm's parents run an inn called the Trout, on the banks of the river Thames, and all of Oxford passes through its doors. Malcolm and his daemon, Asta, routinely overhear news and gossip, and the occasional scandal, but during a winter of unceasing rain, Malcolm catches wind of something new: intrigue. He finds a secret message inquiring about a dangerous substance called Dust—and the spy it was intended for finds him. When she asks Malcolm to keep his eyes open, he sees suspicious characters everywhere: the explorer Lord Asriel, clearly on the run; enforcement agents from the Magisterium; a gyptian named Coram with warnings just for Malcolm; and a beautiful woman with an evil monkey for a daemon. All are asking about the same thing: a girl—just a baby—named Lyra. Note: This audiobook was recorded from the U.K. edition. PHILIP PULLMAN is one of the most acclaimed writers working today. 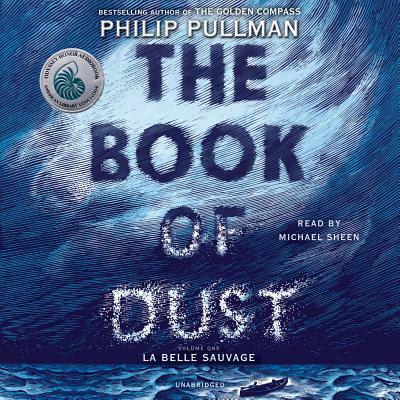 He is best known for the His Dark Materials trilogy (The Golden Compass, The Subtle Knife, and The Amber Spyglass), which has been named one of the top 100 novels of all time by Newsweek and one of the all-time greatest novels by Entertainment Weekly. He has also won many distinguished prizes, including the Carnegie Medal for The Golden Compass (and the reader-voted “Carnegie of Carnegies” for the best children’s book of the past seventy years); the Whitbread (now Costa) Award for The Amber Spyglass; a Booker Prize long-list nomination (The Amber Spyglass); Parents’ Choice Gold Awards (The Subtle Knife and The Amber Spyglass); and the Astrid Lindgren Memorial Award, in honor of his body of work. Pullman was knighted for services to literature in the New Year's Honors 2019. Philip Pullman is the author of many other much-lauded novels. Three volumes related to His Dark Materials: Lyra’s Oxford, Once Upon a Time in the North, and The Collectors. For younger readers: I Was a Rat! ; Count Karlstein; Two Crafty Criminals; Spring-Heeled Jack; and The Scarecrow and His Servant. For older readers: the Sally Lockhart quartet (The Ruby in the Smoke, The Shadow in the North, The Tiger in the Well, and The Tin Princess); The White Mercedes; and The Broken Bridge.